Went for a walk down Marrickville road in Marrickville a couple of days ago. It was interesting to notice the things that have changed since the last time I visited some years ago (and what hasn’t). I remember the the McDonalds had closed, but not at the time been replaced. And I was interested to see it had been replaced by Oporto. So, is Oporto the new McDonalds? It is interesting to see its expansion in Sydney. And nice to see an Australian fast food chain storing doing so well. I see also that Singapore Gourmet has gone. Not my favourite Vietnamese restaurant, but ok if every it was later at night and everything else was closed. Though it seems to have been replaced by another restaurant of the same type. And, on the corner of Victoria and Marrickville roads, there is still the trusty Victoria Yeros. Where else would a cab driver get food at 2am in the area? 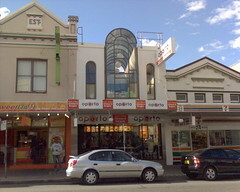 This entry was posted in Photos and tagged marrickville, McDonalds, Oporto. Bookmark the permalink.